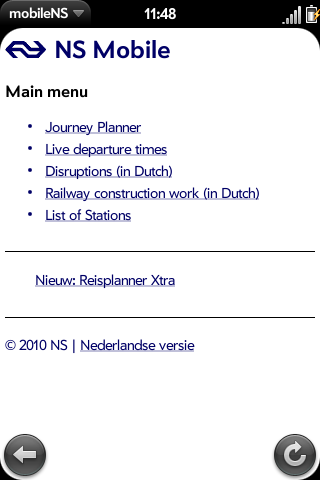 A Palm WebOS optomised app for mobiel.ns.nl, the Dutch railways mobile site. Although you could visit the site from the Palm web browser, I found the fact that I had to zoom in to view it properly a tad irritating. I'm currently working on a beautified version of the app and it should be completed in a couple of weeks.